Sibling rivalry occurs naturally as children grow and can be a positive aspect of a child’s development, allowing them to work through disputes within the safety of their family unit. The skills they learn by fighting through disagreements with their siblings can serve them well when they encounter conflict, wherever it may occur, as adults. But when parents have recently separated or divorced, that once seemingly simple sibling rivalry can quickly become an unruly battle that threatens the health of their relationship. Often beginning soon after the second child is born, sibling rivalries tend to peak when brothers and sisters are between 10 and 15 years old. While most rivalries will not erupt into anything further than the occasional (or sometimes more frequent) fight, if allowed to cause physical or emotional damage, sibling relationships can suffer lasting harm long after childhood fights over toys have ended. Unsurprisingly, divorce has the ability to exacerbate conflict between siblings for many reasons. Knowing what causes sibling rivalries to flare while you’re going through a divorce is the first step to preventing them from getting out of hand. Rivalries can occur when siblings feel they have to compete for their parents’ attention. While in the midst of a separation, parental energy is heavily tapped by navigating new roles and adjusting to shifting responsibilities. Parents may find it more difficult to commit the same amount of time to each child individually as they once could. If siblings have different reactions to a divorce, where one child may be more vocal in their emotional needs than another, the inconsistency of parental involvement with each child personally may be further intensified. Prevention: Divorce may leave you emotionally exhausted, but it’s crucial to still recognize and validate the toll it may take on your children as well. And remember to check in with all of your children. One may speak up more than another, but the support and love they will need is the same. Spending time with children individually after a divorce may be more difficult to coordinate, but it’s important for each parent to interact with each child alone and for kids to feel their parent’s full attention. If you can, work with your co-parent to come up with a plan that allows both of you to have one-on-one time with each of your children. 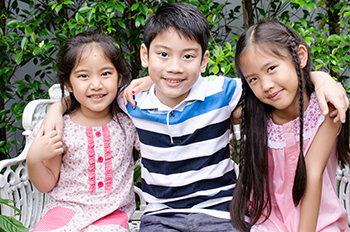 Participating in activities unique to each child can also help show your kids that you still see them as individuals. Children historically have the terrible habit of blaming themselves for their parents’ separation. The same pattern can be observed between siblings, where one may see the trouble caused by another as the root of parenting strife. Prevention: In any divorce, it’s important that parents emphasize to their children that they are not the cause of the split. How you relieve any fears your child may have depends on their personality, but making it clear from the very beginning will help prevent internal blame from taking root. This is doubly the case if one of your children was experiencing any difficulties that caused even subtle tension or disagreements leading up to your separation. Kids will be processing many new and frustrating emotions, and placing the blame for the divorce on their sibling’s struggle may be all too easy. When a family goes through a separation, every family member must acclimate to the changing flow of everyday life. Stress and anxiety will find new ways of presenting themselves in your children, one of which may be an increase in conflict with their brothers and sisters. Prevention: Family conflict is one way that children learn how to manage their own disagreements, so the easiest way you can help them work through sibling conflicts positively is by modelling the best behaviour with your co-parent. If they see you and your co-parent resolving conflicts with mutual respect and positivity—instead of shouting matches and low blows—you’ll be giving them the tools they need to solve disputes not only now, but also for the rest of their lives. Sibling relationships will never be conflict-free, separated parents or no. But sibling rivalry should not be a cause of long-term damage to your children or their relationships. Instead, arguments between siblings should be constructive, helping them learn how to manage disagreements, deal constructively with anger, and process their emotions. Preventing sibling rivalries from becoming destructive during divorce should be a primary concern for co-parents, but as long as you’re attentive to your own communication and the needs of your children, helping your kids through conflict will come naturally.